Our poster titled "Towards Learning Strategies and Exploration Patterns for Feature Perception" received a distinguished poster award! 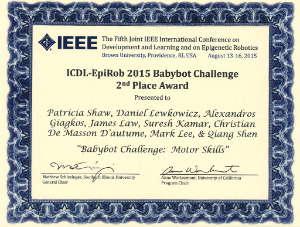 iCub was used to reproduce the longitudinal study of early reaching in infants between the ages of 1 and 19 weeks, as part of the Babybot challenge at the IEEE International Conference on Development and Learning and on Epigenetic Robotics 2015. The study of the challenge was based on the work Claus von Hofsten presented in 1984, a major finding of which was that the number of successful reaches in babies declined at week 7 and increased again just after, forming a U-shape activity curve. By utilising the MoDeL's architecture and system and by carefully designing experiments based on the findings and constraints reported in the infant development literature, the iCub robot was able to experience an artificial staged development similar to the infants in the initial study. The presented study was awarded the second place in the challenge as iCub was shown to achieve similar results in terms of successful reaches and allowed conclusions related to the importance of mapping early sensory-motor experience and repetitive interactions during infancy to be drawn. Following the success in 2015, Sandy Spence and research staff of the project MoDeL won the 1st prize in the People Category of the Engineering and Physical Sciences Research Council (EPSRC) photography competition for a second, consecutive year! 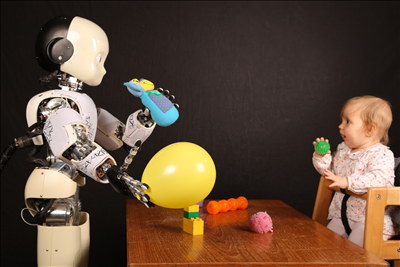 Little Caiya features in 'iCub and the tutor', sharing her toys with the robot while playing. The image reflects MoDeL's research work, investigating mechanisms that allow the iCub to autonomously learn properties of its immediate physical environment, based on infant development and learning though playing. Starting from data based on behaviour in the womb, the iCub follows the early stages of infant development to be able to learn the coordination between sensors and motors, building up the levels of skills and understanding. This project is exploring the growth of human behaviour in order to produce methods for self-motivated learning robots. The Greatest Discovery, by Sandy Spence, featuring Ayesha Jones and iCub humanoid robot won the 1st prize in the People Category of the Engineering and Physical Sciences Research Council (EPSRC) photography competition.